Shelby is back! Hosts Jesi and Shelby have finally reunited for SPEW #6: Some Princes are Effectively Warthogs. In this episode, SPEW hosts discuss female representation in movies and TV shows from their childhood and today. Some highlights: the babes consider how important representation is for little girls, whether gender representation affects how girls’ relate to a character, and some of their favorite women in nerd and geek media. From Princess Mononoke, to A League of Their Own, to Practical Magic, to Now and Then, movies show generations of children what it means to be female. Shelby and Jesi love to assess how these films and many more impacted them as a children. Jesi fesses up to her childhood love of Disney, and Shleby graciously forgives her for it, but only because she has her own guilty pleasures, of course. Tune in to SPEW #6 to find out what Jesi and Shelby think about many cult nerd and geek culture films, as well as why some princes are warthogs. On the next episode of SPEW, the hosts Jesi and Shelby get super serious about Pokemon Go! And when we say serious, we mean Jesi has basically abandoned her entire life to be the best Pokemon trainer this world has ever seen. If you love the SPEW babes and all their quips and quirks, listen to episodes 1 through 5 here! SPEW is a nerd culture podcast based out of Fort Myers, Florida. 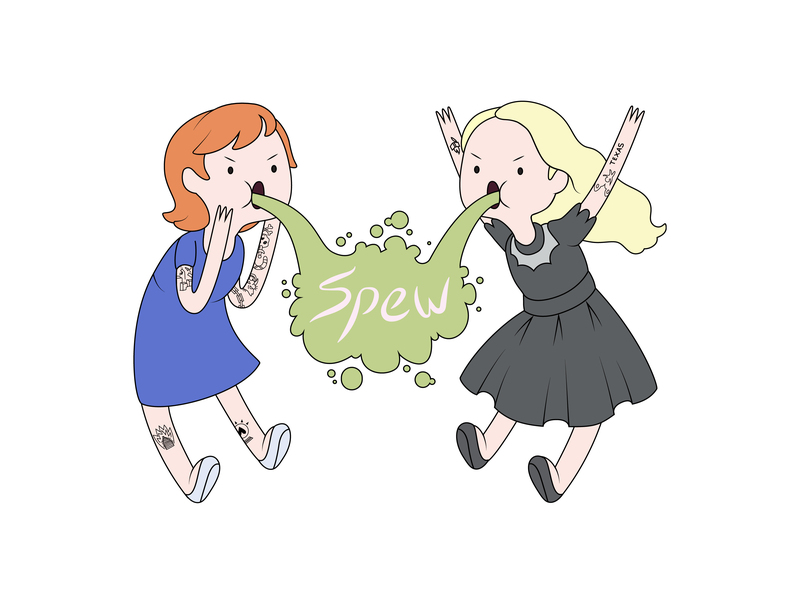 Hosted by Shelby and Jesi, SPEW is a comedy show that features discussion about up and coming movies, popular and underground fandoms, conventions, comics, scifi, fantasy, and how the feminisms reflects on the nerdisms. The world of podcasting is filled with voices providing invaluable commentary, humor, and storytelling, but there are no active podcasts discussing feminism from a nerd perspective or nerd culture from a feminist perspective. SPEW is hoping to fill this gap! The title of this podcast is inspired by a shared favorite fandom of co-hosts Jesi and Shelby – Harry Potter. Fans of the book series will recall S.P.E.W. as the passion project of Hermione Granger – Society of the Promotion of Elfish Welfare. Hermione refused to ignore the oppression and mistreatment of elves by the wizard majority despite the ridicule and scorn she received anytime she spoke up. This acronym is a fitting title for our show as feminists are often mocked and harassed for daring to speak out against injustice in nerd culture. To keep things interesting, we’ll be changing the meaning of the words behind the acronym with each episode. New episodes will be posted weekly so subscribe to SPEW on iTunes or Stitcher, follow us on SoundCloud, and join us on Facebook, Instagram, and Twitter t to contribute to conversation, meet special guests, and get in on giveaway, games, and general geekery. Jesi is a feminist Texan and photographer living in Cape Coral, Florida. She is a co-host on the podcast SPEW and collaborates on photo projects with Love Your Rebellion.